On the ‘Today programme on BBC Radio 4, Tuesday 29th January, there was a debate between Stephen Pollard of the Jewish Chronicle and Steve Bell, political cartoonist for the Guardian, over the Gerald Scarfe cartoon in the Sunday Times published on Holocaust Memorial Day – depicting mangled, tortured bodies being buried over with bricks laid by the bloody trowel of a sinister Israeli leader. Pollard advanced an argument similar to the one he made so eloquently in The JC today, arguing that the cartoon slips into antisemitism because it invokes the blood libel, and while papers should always have the right to publish offensive material, possessing such freedom to offend doesn’t mean that it is always the correct decision to do so. Bell’s fictitious history of Israel’s founding is as characteristic as it is malicious, as it was the tiny Jewish state which was forced, a couple of years after the Holocaust, on the day of its founding, to defend against five invading Arab armies intent on extinguishing their presence from the river to the sea. Bell’s revisionism also excludes the shameful episode after Israel’s founding, in which hundreds of thousands of Jewish citizens of Arab countries were punished for the crime of Israel’s continued existence by being systematically expelled – that is, ethnically cleansed – from land where their ancestors had lived for hundreds of years. So, what does Steve Bell know about “real” antisemitism? My guess is that he doesn’t know too much. While Bell was all too willing to publish a cartoon (during Israel’s military operation in Gaza) depicting weak, cowardly British leaders being controlled like puppets by a powerful Jewish leader, when has he ever employed such graphic agitprop to mock “real” antisemites who occupy the landscape of the Arab Middle East? Did the “populist” liberal satirist ever fancy the idea of caricaturing Egypt’s President Morsi, for instance, who characterized Jews as descendants of apes and pigs, and who told his fellow citizens to nurse their children on Jew hatred? Additionally, has he ever thought to ridicule Palestinian President Mahmoud Abbas for engaging in Holocaust denial? Finally, has it ever occurred to Bell to mock the ubiquitous commentators and clerics in the Arab and Muslim world who still peddle in the most bizarre Jewish conspiracy theories, such as the charge that Jews use the blood of non-Jewish children to bake their ‘Sabbath’ bread? Of course, if Bell did decide to direct his righteous ire at those who engage in such “real” antisemitism – and perhaps even at arrogant, hypocritical media groups which have actually championed the cause of such crude and unrepentant racists – he’d be hitting just a wee bit too close to home. 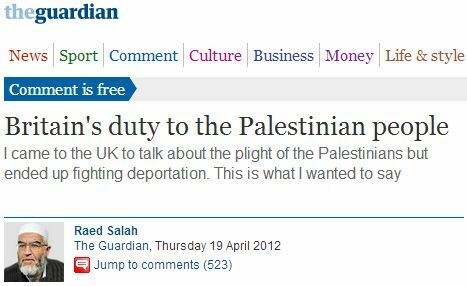 A ‘Comment is Free’ essay by the extremist who evoked the “real” medieval blood libel cited above, Raed Salah, was published on April 19, 2012, Israel’s official Holocaust memorial day. Religion is so bloody weird. To hell with all of them. It has nothing to do with religion as such, with what people believe – this is an attack on people who self-identify as a group. It is the same hatred as Hitler showed. Are you really so stupid as to think that if the Jews had believed in something else Hiter wouldn’t have used them as a rallying-cry for his Third Reich? What CIF Watch forgot to tell: Scarfe often makes use of images of blood in his cartoons. Still, even you surely agree that the timing is out of place and in extreme poor judgment, to say the list. I agree that publishing such a cartoon on Holocaust Day is unacceptable. However I blame it on ignorance, not on an intent to hurt the Jewish community. Instead of accusing the Sunday Times of being antisemitic, which is grotesque, we should ask them to organize lectures on the Holocaust for their staff, so that they don’t forget about Holocaust Day next year. Except that this very article mentions it! Feel silly? You ought to. Utterly stupid comments from Bell. But this article does also remind us that Scarfe’s blood-ridden cartoons are by no means reserved for Jews. “Blood libel” has a strict set of images which must always contain a newborn. It came from the absurd, antisemitic rumor that Jews would steal Christian children and sacrifice them, using their blood for ritual purposes. This cartoon does not feature any newborns, not even children. Really? Who’s at the bottom of the wall? I bet his name ends with Al Dura? Dear Itsik, it’s really below you to make fun of a child who was accidentally killed by the Israeli army during crossfire in Gaza. He was only one of many Palestinian and Israeli children who died during these years. Please leave conspiracy theories to the likes of SerJew or Friz. This is a typical lie of nuttie, the case who shot the cjild is before the bars in FRance. Most likely shot by Palestinian snipers. The blood libel has nothing to do with new born Dr. Nat. Why don’t you search a little about the blood libel in England around 900 years ago? “Persecution of England’s Jews continued, with massacres at London and York during the crusades. This antipathy eventually culminated in the expulsion of all Jews from the country in 1290. Most were only allowed to take what they could carry. A small number of Jews favored by the king were permitted to sell their properties first. Almost all evidence of a Jewish presence in England would have been wiped out if it had not been for the efforts of one monk, Gregory of Huntingdon, who purchased all the Jewish texts he could to begin translating them. Now this, Nat, is Ethnic Cleansing. Can you tell the difference between this and what happened in 1947-9 to the Arabs leaving in British mandated Palestine? Itsik, if you have a problem with the Brits, why don’t you go and build illegal settlements on their territory, rather than in the territory of the state of Palestine? Palestinians had nothing to do with the Holocaust, or with Christian antisemitism over the centuries. May I remind you that Spain’s Jews were massacred by Spanish Christian kings but protected by Muslim Arab rulers? Why don’t you go and build illegal settlements in Spain too? Having listened to that clip from ‘Today’ I struggle to find a way that Steve Bell could say he is not an antisemite. You were there, of course. Don’t feed the troll. As you can see, he is starving for attention. In the case of the Iraqi community, make that “been there for millenia–since the Babylonian exile, over 2,500 years ago. cba, have you read the following about the Jews of Nineveh? It’s probably escaped him or if he does not he’s choosing to deny it to himself. Guardian/BBC poses the greatest threat to liberty, equality and the rule of law. They choose the Holocaust Day to sully the memory of each and every soul that perished at the hands of Nazis. What Bell believes in and says via his cartoons about the state of Israel could be heard by the worst anti-Semite in the Arab/Muslim world. And he is not alone in this, the majority of the West, fed for years on lefty anti-Semitic propaganda, would echo Bell. Think about it, the fascist left are now in control. The lunatics have taken over the asylum. Those who pose the greatest threat to liberty, equality and the rule of law are the far-right wing extremists who engage in wild conspiracy theories and are ready to kill to prove their point – Yigal Amir was one of them. There are many similar examples from the left. Shall we agree that extremists are a danger? Nat, do you include among them the far right, authoritarian and fascistic Islamic extremists, because if you do then to my amazement I find myself agreeing with you. Guardian/BBC poses the greatest threat to liberty, equality and the rule of law. In which parallel universe would that be? They choose the Holocaust Day to sully the memory of each and every soul that perished at the hands of Nazis. Where have the Guardian/BBC done such a thing? Steve Bell made a complete arse of himself on the Today programme. The contrast between his bullying pompous ranting, and the dignity of the JC’s Stephen Pollard could not have been clearer. We now have a much better idea of what sort of person Steve Bell is. He is a rigidly opinionated gobshite, with an ego the size of a planet. He could do with anger management classes too, he’s quite clearly unable to control himself. The wonder then is not over Scarfe or Ward’s sense of timing [i.e. being anti-Semitic on the Holocaust Memorial Day], but why at any point in any year they would be so keen to spread lies and to bait Jews by comparing the actions of the Jewish state with those of a genocidal doctrine of Nazism which sought to annihilate the Jews. It’s because they have no sense of shame, no real understanding of what is taking place in the Middle East and because it just may be that they are racists – not for me to accuse of course but a person is judged by what they do, not just by what they say and Bell’s cartoons, and Ward’s website kind of give us a hint. I’ll take no reading recommendations from the bigoted scumbag who calls gays and lesbians “idiots”, ta very much. No, you’d rather live in ignorance and swallow lies. Ta ‘n all. BTW, just to spell it out for you and other thickos out there, I call anybody who support Hamas and Islamists idiots — that includes gays and lesbians, not for them being gays or lesbians. You would understand that if applied an ounce of logic. June, your homophobic comments are appalling. You obviously lack comprehension of the English language, otherwise you would have understood my above comment. Troll. June calling another poster “troll”. You do that all the time. More schizoid hypocrisy from the church-lady. Classical indeed. I’ll bet you pick words like that from a thesaurus. And spare us the anti-Christian bigotry. Yeah, church-lady, you are total schizo, navigating in your moronic world of politically-correct classifications. In sum, you are ridiculous. Hey, “nat”, your hypocrisy is appalling. Sorry to say this but do you actualy try and read what people say? Pretz, in light of June’s explanation do you still hold the same views? Would you think that some one who’s an idiot should not be called an idiot if he / she happened to be gay? Ha! That’s a tough one for a paragon of political correctness like pretz (aka church-lady). It causes great dissonance because for these folks “the opressed” cannot be criticized: that anathema. Of course, htye can generalize freely about Jewish “settlers”, “right-wing extremists” and “likudniks”. Their hypocrisy is mind-boggling. Not sure Pretzelberg generalised about Likkudniks per se, more about the new divertion to which Likkud shifted at the post Sharon era. Frankly I never liked it myself, and being an Israeli one tend to generalise freely about political parties. Still no one should lose sight of the vibrant political landscape Israel has to offer to all of its citizens (and some times to its neighbours’ reps) in comparison to the landscape we see across our Eastern and northern borders where things are being hashed rather quickly. As for the comments made by some people in the heat of the moment I interpret it as a misnuderstanding rather than bigotry. As for me calling Nat an Idiot for instance, this is Dugri talk. Still no sign that pretzl will answer your question. I wonder why. Of course, htye can generalize freely about Jewish “settlers”, “right-wing extremists” and “likudniks”. Crikey. Now you’re just making things up completely! Because I was away from my computer and until just now busy working! Of course you didn’t reply to Itsik’s question, church-lady. Too much cognitive dissonance for you to handle? Absolutely. Why are you defending the person who said: “the willfully blind and idiots like the gays and lesbians” … and also “gays and lesbians … have hijacked the Holocaust for their own anti-Semitic and other nefarious anti-Israeli propaganda”. Yeah, that’s the dissonance at work. Do the decent thing and just leave this website. Why don’ t you leave first? Give the example! And then she explained her real views. Maybe time to follow your own advice to others and give her the benefit of the doubt. And then she explained her real views. You must be joking. They’re made at least two comments lambasting “gays and lesbians”. And you have made endless comments lambasting “right-wingers”, “settlers” and whatever enters the “bad” list of political correct doctrine. Not to mention you called people here “mental midgets”, offending the height-impaired population and the mentally-impared in one-stroke. Once again, church-lady, your hypocrisy is just amazing. SHAME ON YOU!!!! Reading Melanie Phiilips here , I suddenly realised that perhaps Scarfe (and less Bell) has not really been exposed to the venom that exists for Jews in the Muslim world (Bell I think knows full well and uses it). Perhaps he (Scarfe) needs to see some “cartoons”, videos and literature (regularly published here on Cif Watch) that is the daily diet and feeds the hatred for Jews in that world – just so that he can realise how his cartoon plays into the hands of fascists. There is of course always a danger that, like Bell, Scarfe may begin to learn from them. And then you cite the notorious homophobe Melanie Phillips! Really ? She didn’t seem to mind having Douglas Murray as a debating partner. June, homophobia is a disease. If you tell that your Islamist friends, we won`t see you back. I`m sure you know what to do. “Nat”, your hypocrisy is appalling. It seems to me that political cartoonists usually deal with current affairs. If you had read your link to Abbas’ supposed Holocaust denial you would have seen that he was writing in 1983 and that he withdrew these views completely in 2003, describing the Holocaust as “[a] terrible, unforgivable crime against the Jewish nation”. So abbas believes in a Jewish nation. does he also believe in the first or second temples? Cause his schoolbooks and national tourist guides don’t. He withdrew “supposed” views? You are hilarious! I have come to the conclusion that people like Rabbi Rosenberg threaten others because of the passion he brings to his message. My fantasy is that others would realize that his personal history is unique and while he functions as a rabbi in Edison, he also has worked for many years with the second generation community in the area, for no money, for no press, but because he identifed a need. No one who was directly affected by the Holocaust and has spent years coping with that legacy, for many of us are in our forties, fifties and sixties now, want to take away anything from the mainstream Jewish community in this area, whose parents are not survivors of the death camps, etc. We accept that for the most part people, Jews, really don’t care to hear our stories and the incredible insight that our parents’ experiences have had on shedding light on our own lives, to permit us to push through challenges that others might find too daunting. I think many of us 2-Gers watched our parents get up every day and function, and for me anyway, watching my mother walking to the farmers market with her basket every Saturday and then meeting me for lunch and filling my head with so many amazing stories, to take the bus home together, getting sick and laughing as we cosumed 2 pounds of beautiful sour cherries like there was no tomorrow. Those memories, just simple everyday connections where my mother was happy and engaged in life, Auschwitz number and all, filled me with a sense of awe and motivated me to go out in the world to try to make it a better place. And so many second generation individuals are just like me. We know on a spritual level that Hatikvah and our survivor parents and Israel go hand in hand. We feel it everyday it is part of our DNA in a way that relates to my mother’s entire nuclear and most of her extended family being brutally murdered just because they were Jewish and that is the state of affairs for the Israelis at this very moment. They know that they could be hit by a rocket or have their children bombed into littele pieces coming home from school and this is not a movie, this is how it is for the Jewish people who live in Israel every day. My mother would not let me go to Israel during high school. She beleived that I would fall in love with the country and maybe with a person and decide to make aliyah. She said she lost too many people and that she needed me to live here.